The Spring, 2017 issue of Atlanta magazine's HOME with Pineapple House clients Will and Heather Packer. Pineapple House created environments to support and empower the multitude of creative pursuits that define the Packer household. 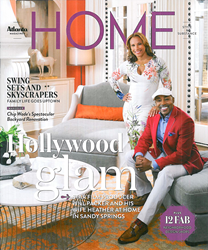 The cover of the Spring, 2017 issue of Atlanta magazine's HOME features a prominent Atlanta couple, Will and Heather Packer. The magazine's ensuing 12-page spread allows readers to get up-close-and-personal with the Packers, as it features them with three of their four children in their family home. The Packer family is headed by dapper Hollywood movie and television producer Will Packer (Straight Outta Compton, Roots.) Although his position with Will Packer Productions and Universal often has him working in places like Los Angeles, Atlanta is home for the Packers. Will's wife Heather, a former model, contacted award-winning Pineapple House Interior Design in 2015, soon after the couple purchased a 13,000 square foot Atlanta estate. According to Pineapple House co-owner Zach Azpeitia, he and designer Kate Fleming quickly embarked on a design adventure that culminated in a power-house where their playful but sophisticated clients could recharge. Azpeitia explains, "Pineapple House created environments to support and empower the multitude of creative pursuits that define the Packer household." Will Packer's success is shaped by focus and determination, and he often serves as an educator and motivational speaker. Last year, the unassuming role model agreed to share more of his home life with the public. The initial unveiling was through the international design authority Architectural Digest in February of 2016. The AD home tour was followed by a more in-depth magazine feature that includes the Packer's children. "Lux & Laid-back" is the cover story for the Spring, 2017 issue of Atlanta magazine's HOME, and is currently on newsstands. According to designer Kate Fleming, "The Packers are humble and genuine people. Their lives are complex and busy, yet they consistently embrace opportunities to educate others and share their formulas for success. It was a pleasure to design a home where they and their children can relax and at the same time, be inspired." Atlanta-based Pineapple House Interior Design is a think-tank of design/build professionals with expertise in interior home design, architectural design, décor, furnishings and construction. Award-winning designers guide clients through any aspect of the design/build process, from decorating an existing home to building a new house or hotel. They were voted the "2017 Best of Houzz Design" and "2017 Best of Houzz Service" by over 40 million monthly users in the industry giant's online network. They were recognized in 2016 as "The Most Innovative Designers in the USA" by the British global construction magazine BUILD. The firm's work has been featured in over one hundred magazines, a dozen coffee table books, and on 12 television networks. Visit pineapplehouse.com for more information. Emmy® nominated Producer Will Packer has established himself as one of Hollywood’s blockbuster hit makers with eight of his films opening number one at the box office. His last number one film, Ride Along 2, debuted in theaters in 2016, unseating Star Wars: The Force Awakens, from the number one slot. In 2015, he served as an executive producer on Straight Outta Compton, a biopic of the rap group N.W.A, that opened number one at the box office, grossed an astounding $201 million and became the best opening weekend for a music biopic—EVER. His next feature is Girls Trip, starring Regina Hall, Queen Latifah, Jada Pinkett Smith and Tiffany Haddish. It hits theaters nationwide on July 21, 2017. Visit willpackerprods.com for news and information. 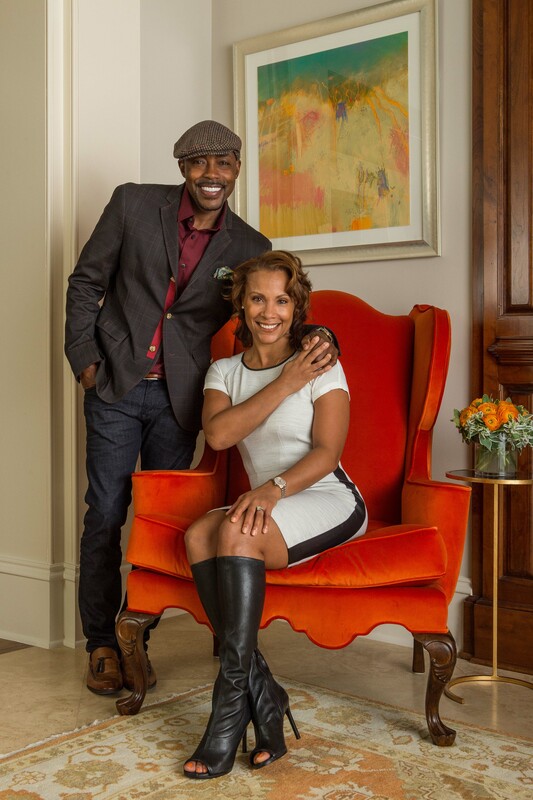 Will and Heather Packer at home in Atlanta.The popular film and television producer Will Packer is shown with his wife Heather in his Atlanta residence, decorated by Pineapple House Interior Design.